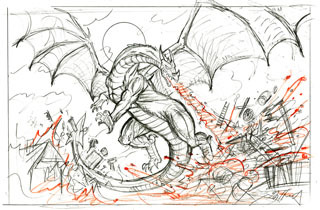 Greg has just completed this beautiful sketch of SMAUG destroying Laketown. This scene is from The Hobbit. The finished pencil was done as a commission. This piece was a preliminary sketch. In 1976, 1977 and 1978 Greg and Tim Hildebrandt's Tolkien calendars defined the look of J.R.R. Tolkien's Epic, The Lord of the Rings. The brothers gained fame as The Brothers Hildebrandt for the first Star Wars movie poster and their Lord of the Rings calendar art. Greg enjoys going back to Tolkien's Epic occasionally to do a piece for a collector.